Perth Vintage Cycles: Rene Herse vintage bicycles. Perth Vintage Cycles ....for those interested in vintage bicycles. Rene Herse was a French bicycle builder who was born in Paris in 1913. Herse constructed his own hand-built bicycles in France prior to the second world war and beyond. Known as "constructeurs", French bicycle manufacturers hand-built their own beautifully crafted frames and bicycle components. Their bicycles were magnificent - each a work of art in itself. Each component was lovingly designed and hand crafted with magnificent French engineering and styling. Herse was one of the outstanding French "constructeurs" and was always associated with the pinnacle of French cycling from the 1940's until his death in 1976. I recently rode in the Fremantle Tweed Run and spotted a Rene Herse bicycle. Although it wasn't a show piece, the owner was very proud to have such a bicycle. I would have loved to own it too!! He told me that he had bought the frame in France whilst on holidays some years ago and on his return to Perth, Western Australia, lovingly assembled the bike with Rene Herse and other French components over an extended period of time. The Rene Herse bicycle with randonneur touring handlebars. A beautifully crafted French stem, typical insertion size of 22.0mm. An "Ideale" brand derallium saddle. Beautiful high flange hubs with brass wing nuts. Very neat front derailleur with chain guard. He has definitely captured the Rene Herse feel!! From my study of the components I think that this bike is possibly from the 1950's - but I'd like to be corrected on this if need be. The bike is fantastic - and even better in the flesh. Vintage French bicycles are unusual. 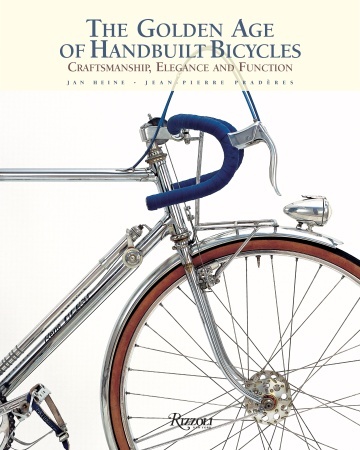 This is mainly because the many threaded components used to construct the bicycles have different thread ratios (tpi - threads per inch) to those of vintage English bicycles. Some of the French sizings are also awkward. For instance.....the Britsh standard for the diameter of a quilled stem (insertion measurement) is 22.2mm, however the French went with a 22.0mm insertion size as standard. Pedal thread ratios are also quite different. Old Australian bicycle components tended to carry British thread ratios, so locating French threaded bicycle components in Australia was, until recently, very difficult. Amazingly, vintage French threaded bicycle components are now easily accessible through internet auction sites - eBay, etc, so finding the parts for such a build in Australia is now not so difficult. 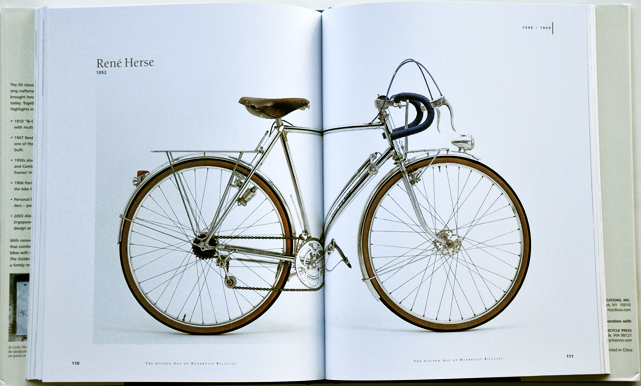 Coincidentally, after spying the Rene Herse bike I came across a fantastic book called "The Golden Age of Handbuilt Bicycles". 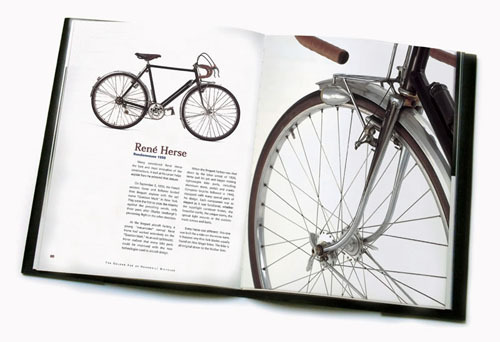 The book is brilliant and records the history of French hand-built bicycles from 1910 to modern times. The photography in this book is amazing and features several outstanding Rene Herse bicycles. Until next time, safe riding. Bikeville.com - the art of losing customers.